You Are Here: Home » Dr. Dhepe » Can Bypass Heart Surgery Scar Be Removed? Can Bypass Heart Surgery Scar Be Removed? India is seen as diabetes and coronary heart disease capital of the world. According to the current estimates, India will soon have the highest number of heart disease cases in the world. Coronary Artery Bypass Grafting (CABG) is a respite for heart patients. However, a heart surgery leaves a distinctive mark, generally painless, but they may be cosmetically unpleasant. In some cases, scars on the skin can develop into a special form of oversized scar called a keloid. 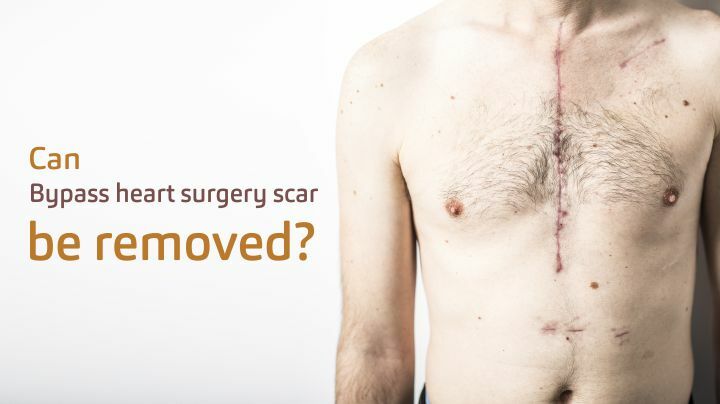 So, can a bypass heart surgery scar be removed? Coronary artery bypass grafting (CABG) is a type of surgery that improves blood flow to the heart. It’s used for people who have severe coronary heart disease (CHD), also called coronary artery disease. This surgery treats complications of ischemic heart disease via bypass surgery of blocked arteries, correct congenital heart disease, or treats other heart diseases such as endocarditis, mitral valve prolapse, and many more. It’s clear that open heart surgery is a major operation, which increases the risk of significant scarring. A scar typically takes 18 months to mature and usually, the hypertrophic scar is persistently red, raised and sometimes itchy. Presternal wounds have been reported to often scar poorly resulting in hypertrophic scar formation in comparison with scars formed in other anatomical locations. Hypertrophic scarring can affect people aesthetically, symptomatically and psychologically. Keloids and hypertrophic scars represent an exuberant healing response that poses a challenge for physicians. Patients at high risk of keloids are usually younger than 30 years and have darker skin. Sternal skin, shoulders and upper arms, earlobes, and cheeks are most susceptible to developing keloids and hypertrophic scars. Can laser treatment help in treating Hypertropic scars? Laser scar therapy, particularly fractional ablative laser resurfacing, represents a promising and vastly underused tool in the multidisciplinary treatment of traumatic scars. If you’ve ever looked into any other form of laser therapy, you already know that there are dozens of unique types of lasers out there all claiming to provide their own benefits for different applications. When it comes to treating hypertrophic scars however, the gold standard is the pulsed dye laser (PDL). Several studies have shown that this treatment reduces the hypertrophic scar’s thickness and redness, while also helping to curb any of the scar’s side effects (especially pain and itchiness). Hypertrophic scars can be caused by repetitive trauma, infection or foreign bodies interfering with wound healing, or simply form in clean wounds. Though hypertrophic scars are also associated with negative healing of wounds, they do not grow out of control; rather, they reach a definite size before stabilizing. Are lasers safe to treat bypass surgery scar? Yes, lasers are safe to treat bypass surgery scar as it’s a non-surgical option for surgical scars. Lasers contain photons, so they are light, and not ionising radiations, so it is considered to be safe. How early should you treat scars? The earlier the better! With the combination approach of a new minimally-invasive laser based treatment alternatives UltraPulse SCAAR FX and Enerjet, you can see amazing improvement in severe scars. The combined effect of both treatments promotes collagen generation, creating thicker dermal tissue and correcting skin imperfections for long-lasting, healthy aesthetic improvement. Immediately following treatment, your skin will be warm, red and swollen to varying degrees, depending on your customized treatment settings. Most patients are able to resume their daily activities within a week. To support you in the healing process, a daily skincare routine should be prescribed and dressings should possibly be applied to protect the treated area.